Heat oven to 375°F. Line 15x10x1 -inch pan with waxed paper, foil or cooking parchment paper; generously grease waxed paper or foil with shortening. In medium bowl, beat eggs with electric mixer on high speed about 5 minutes or until very thick and lemon colored. Gradually beat in granulated sugar. Beat in water and vanilla on low speed. Gradually add flour, baking powder and salt, beating just until batter is smooth. Pour into pan, spreading to corners. Bake 12 to 15 minutes or until toothpick inserted in center comes out clean. Immediately loosen cake from sides of pan and turn upside down onto towel generously sprinkled with powdered sugar. Carefully remove paper. Trim off stiff edges of cake if necessary. While cake ¡s hot, carefully roll cake and towel from narrow end. Cool on cooling rack at least 30 minutes. Unroll cake and remove towel. Beat jelly slightly with fork to soften; spread over cake. Roll up cake. Sprinkle with powdered sugar. Increase eggs to 4. Beat in 1/4 cup unsweetened baking cocoa with the flour. If desired, fill cake with ice cream instead of jelly or jam. Spread 1 to 1 1/2 pints (2 to 3 cups) slightly softened ice cream over cooled cake. Roll up cake; wrap in plastic wrap. Freeze about 4 hours or until firm. 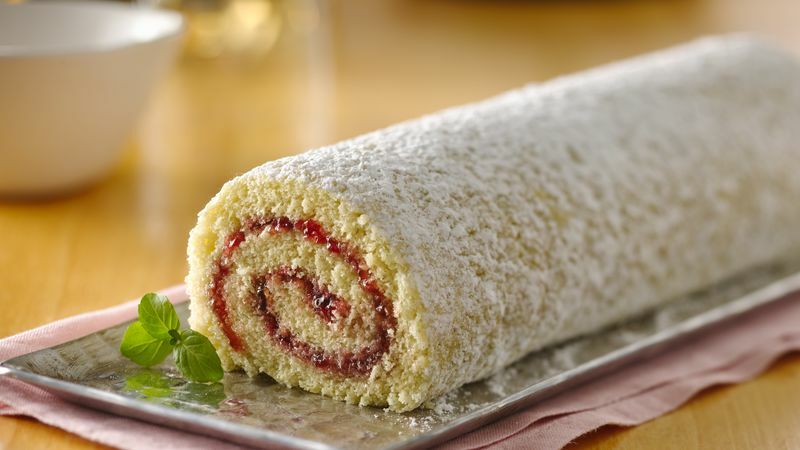 Make jelly roll cake as directed adding 2 teaspoons grated lemon peel to batter with flour. Omit jelly and spread cake with 2/3 cup purchased lemon curd or make Lemon Curd. Roll as directed. Store covered in refrigerator. Make jelly roll cake as directed substituting 1/2 teaspoon almond extract for the vanilla. In small bowl, whip 1/2 cup whipping cream, 2 teaspoons powdered sugar and 1/4 teaspoon almond extract to stiff peaks. Spread over cake and roll as directed. Store covered in refrigerator.